The usual “top-down” algorithm of Russian-American relations will not work under Trump. Hence, it is necessary to change drastically the algorithm – to start building relationships on the “bottom-up” principle. Donald Trump’s first State of the Union speech appears to be carefully prepared and edited many times over. Of course, numerous and corrosive critics found some negative hooks. According to them, Trump impudently attributed to himself the economic achievements of the Barack Obama administration, unabashedly exaggerated his successes in foreign policy, did not criticize the Kremlin enough, etc. But, as a whole, the speech proved to be very moderate both in tone and content. No personal insults to opponents. No doubtful impromptu and ambiguous metaphors. No scandalous behavior. Everything was restrained, balanced, even stylish – in the best traditions of Ronald Reagan or Dwight Eisenhower. He was speaking like a mature politician. President Trump extended his hand to his political opponents, urging the Americans to rally around the star-striped banner in these hard times for the country. Of course, the president did not repudiate the basic principles of the Republican ideology – neither in domestic nor in foreign policy. However, Trump’s performance on the Capitol Hill leads to the conclusion that the former rebel and non-systemic candidate, a tireless fighter against the Washington establishment and the Deep State, in fact acknowledged his defeat. Trump is tired of fighting. The most radical slogans of his program are left in the already distant year 2016. Many former comrades-in-arms have turned into irreconcilable opponents. And his Republican Parteigenossen made it clear to the Oval Office incumbent, that he would not be allowed to manage at his own wish. 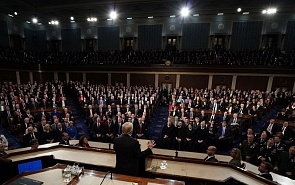 It is noteworthy that the Democrats were very peaceful during Trump’s speech: they did not interrupt the speaker, did not leave the hall, and even sporadically awarded the president’s eloquence with a short applause. In general, Trump’s outstretched hand did not hang in the air. If there is indeed a turning point in the confrontation of “systemic” and “anti-systemic” political forces in favor of the first ones, then Russia should change its tactics toward Washington. It is not so important how many times Trump mentioned Moscow in his speech, and what exact epithets he used against Russia and China. In the end, all this is lyrics and stylistic delicacy. Another important thing is that the American establishment is confidently on the offensive, and the carnival of political revolution in Washington turns into a creeping counter-revolution. In the short term, Russia will have to deal exactly with the Deep State, which has in fact won the positional war against the populist president. The usual algorithm of Russian-American relations has always been based on the “top-down” principle. First, a bilateral summit. Then, contacts between high-ranking officials. The two countries’ leaders (Leonid Brezhnev/Richard Nixon, Mikhail Gorbachev/Ronald Reagan, Boris Yeltsin/Bill Clinton) set in motion the flywheels of huge, heavy and squeaky state machines, and they gradually transferred their bureaucratic energy to new participants in the cooperation process. This algorithm will not work under Trump. Even if it is possible to hold a full-fledged Russian-American summit (for now such an event is not even planned), then it will not be possible to launch the flywheel of “top-down” cooperation. The Deep State will not allow this, Congress will not support it, and Washington think tanks and national media will ruthlessly criticize even the most modest steps of Donald Trump towards Moscow. At best, these steps will be presented as the height of naiveté, unprofessionalism and irresponsibility, and at worst – as a deliberate betrayal of national interests by the US president. Hence, it is necessary to change drastically the algorithm – to start building relationships not on the “top-down” principle, but on the “bottom-up” principle. It would be wrong to count on a well-disposed “non-systemic” president. We should work properly with the “system” as a whole. Even if such work is invisible for a long time, is not always pleasant and not too effective. First, it is better to avoid demonizing the Deep State, which is perceived by many in Moscow as the center of world evil and the stronghold of the pathological haters of Russia. Of course, most of the State Department or the CIA officials, the Congress staff, experts from the main think tanks are not Vladimir Putin’s fans. But these people, at least, have considerable experience of interaction with Moscow and can hardly be considered stubborn paranoids, exalted conspiracy theorists or genetic Russophobes. Deep State consists of rationally thinking professionals, who are always easier to deal with than romantic amateurs are. With all its shortcomings, it is the Deep State that limits Donald Trump’s most exotic and potentially most dangerous foreign policy oddities. Second, it’s time to change the attitude toward the Democratic Party leadership. For some reason (probably because of inertia) the Barack Obama administration is constantly remembered in Russia in the worst possible way, with the two latest presidents constantly juxtaposed. How is Obama bad, and Trump is good? The stubborn facts show otherwise. For example, Obama pursued a consistent policy of rapprochement with Iran, and Trump returned to the most severe pressure on Tehran. Obama followed the international consensus on the status of Jerusalem, and Trump destroyed this consensus. Obama did not resort to direct military action against Bashar Assad, and Trump did not hesitate to give an order to launch missiles against the Syrian Al- Shayrat airbase. Well, who after all created more problems for Russia – Democrats or Republicans? Restoring relations with the United States is not a one-year task. It goes far beyond Donald Trump’s four-year rule. But in order to begin, we need to change the usual algorithm of interaction between the two countries. Not relying anymore on the mystical “chemistry,” which unfathomably arises in the course of communication between people, who stand lonely on the tops of the political power pyramids.